As a platform, the Tablet PC has never reached the mass market acceptance that Microsoft expected. However, as a business tool it has seen steady and continued growth. So much so that Dell has finally launched its first device into the market with the Latitude XT (£1409 inc. VAT). It's an impressive machine, weighing a mere 1.6kg and is finished in black aluminium, giving it a tactile feel but also a robust quality to the design. Almost all Tablet PCs currently use a digitised screen, which you need to access using an electronic pen. However, the XT has a 12.1-inch touchscreen panel, so you don't need a special pen to activate it. The benefits are obvious - you can write directly to the screen and the technology doesn't need as thick a sensor layer, which results in a sharper image. The downside is that it's harder to use in slate mode - accidentally touch the screen with the palm of your hand and the sensor will detect it. When in slate mode you can access four function buttons, such as locking the screen, rotating the display and launching your email, and you'll even find a biometric fingerprint scanner built in. The screen has an acceptable 1280 x 800-pixel resolution and it's certainly one of the most usable screens we've seen on a Tablet PC. Supported by the ATi Radeon Xpress 1250 graphics card, you'll find this machine responds well to multimedia tasks. The clamshell design means there is a good-sized keyboard onboard. The keys are individually mounted and have a firm stroke as you type, making it highly usable. With a touchpad, pointing stick and dual mouse buttons, you can navigate in your preferred manner. You won't find an optical drive fitted, but it comes with a docking station that includes extra ports, as well as a DVD rewriter as standard. When it comes to connectivity, you'll find Wi-Fi and Ethernet at the latest high-end speeds. The USB ports are conveniently spaced around the sides. Using an Ultra-Low Voltage processor, this isn't the fastest machine on the market, but we found it more than responsive for typical office tasks. More impressive is the battery life, which at just over three hours running Windows Vista Business was more than typical for a machine this size. 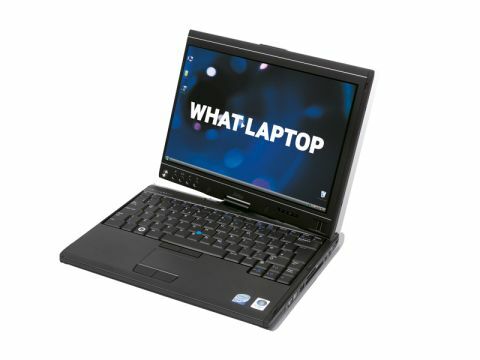 The Dell Latitude XT takes the notion of the Tablet PC and creates a machine that is light and easy to use. We're not convinced the touchscreen will make it easier to use long-term, but with an improved contrast ratio, it means images will look crisper if you predominantly use this machine as a laptop.